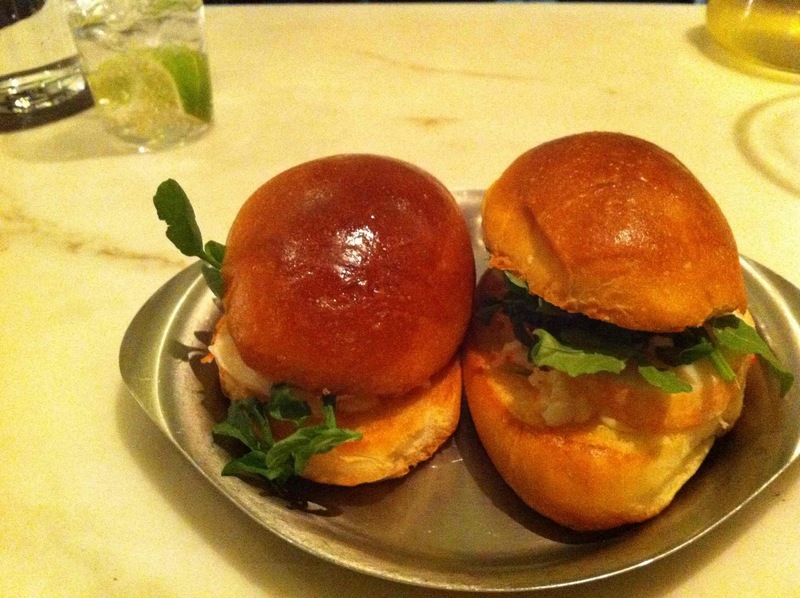 No wonder the Melbourne Age’s Good Food Guide gave Golden Fields the gong for best new restaurant of 2011. I caught up with fellow foodie Samantha for dinner in Melbourne, and having been given the tip-off on this great new place by Perry during lunch at Coda the day before, I decided it was the perfect opportunity to give it a try. Golden fields indeed - it's like I died and went to a foodie version of the Elysian fields. Golden Fields is another one of those modern Aussie tapas places, and on account of its massive popularity and casual but classy dining ethos, you couldn’t book a table. So we just rocked up and got in the queue. Fortunately, being a school night, it wasn’t a big queue (but the place was packed nonetheless), with only 2 other couples in front of us. We got to perch on a couple of low stools at the front and ordered cocktails to while the short time away – I hadn’t even drunk half of my martini when we were ushered to the long, wide bar and invited to perch on tall stools instead. Other highlights included the sea urchin, duck broth and an unbelievably decadent yet utterly compelling dessert. The sea urchin dish is truly a work of art – I can’t do it justice with a description, so you’ll just have to enjoy the picture. 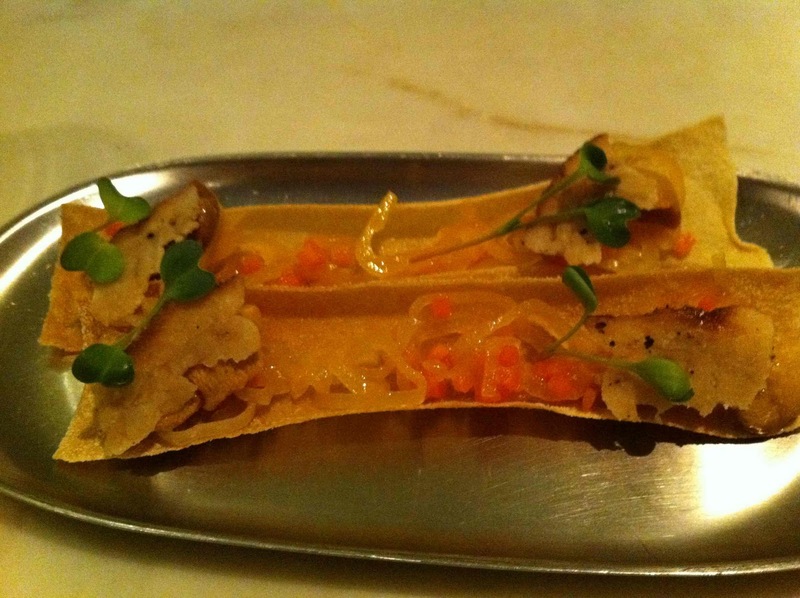 The morsels of urchin were nicely complemented with slivers of fried pork fat (seriously it is good) and the crunchy wafer boat it came on (seemingly akin to deep fried wonton wrapping), together with minimalist garnishing. You couldn’t taste the strong fishiness of the urchin that you would face with a less accomplished chef – it was just a delightful balance of flavours and textures. Even Sam ate some of it, despite her initial squeamishness. The duck broth was recommended by a mate of Sam’s and what a recommendation. 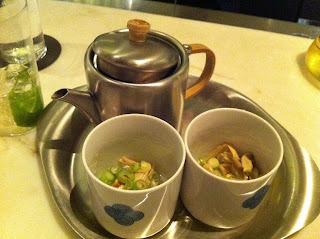 Beautifully rich-flavoured with baby corn and exotic mushrooms, and served in a teapot with oversized porcelain tea cups. You could just keep drinking that stuff, but it is deceptively filling. Now I am not a dessert person by any stretch – I’d rather go savoury if given the choice. But Sam wanted one, and this thing was way too good to pass up, so I shared it with her under the guise of wanting to help her avoid overdosing on sugar. 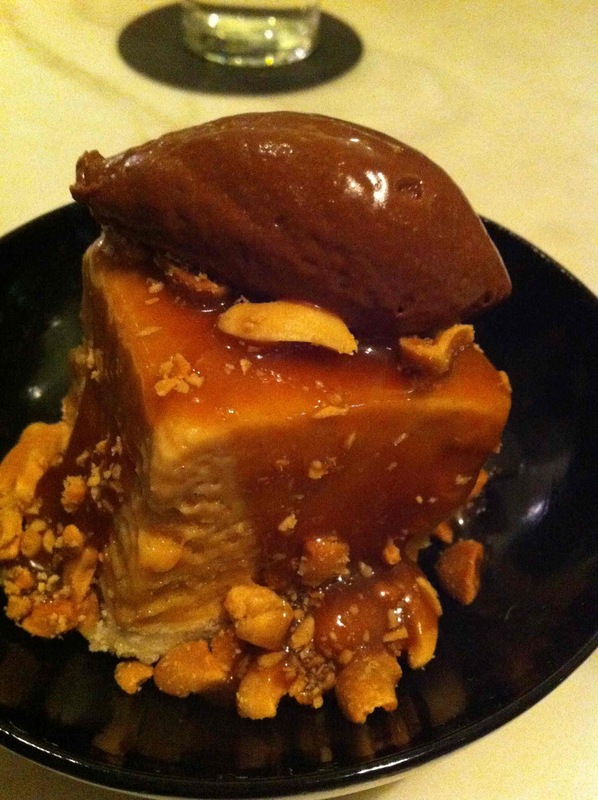 It was just a thick, rich confection of chocolate mouse perched on a chunk of caramel fudgey thing and swimming in a thick peanut-caramel sauce, replete with chunks of peanut. Good thing neither of us is allergic to peanuts. Wow what a place. Once again, great service, with some cheeky and feisty waiters for entertainment factor, although I think I might have put one of them on the back foot with my overly witty repartees (I assure you it doesn’t happen much, since I'm not really that witty) – sorry about that, I was just having a great time and got carried away!